The Devil is on vacation, sampling life in London and reflecting on some of his career highlights, in this grab bag from the British Duncan (first US publication). Lucifer addresses you directly in an intermittent monologue, and his voice will either pull you in or turn you off. It’s flip and in-your-face as it mixes insults and endearments: somewhat like stand-up comedy. But there’s also a smidgen of plot. Gabriel brings Lucifer an offer from God: the chance to redeem himself if he agrees to live as a human. There will be a one-month trial period. Lucifer accepts. He has no interest in redemption (are you kidding? ), but a month in a human body will be a great vacation and a nice respite from the pain that racks him unceasingly. (Or so we are told in passing. For a real taste of Hell, read Stanley Elkin’s marvelous The Living End.) 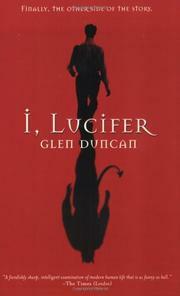 As Lucifer enters the body of Declan Gunn (note the anagram), he experiences sensuous paradise. Now he can taste an ice cream, smell the roses (and the sewers), and scramble his brains with drugs and booze. This Gunn is a sad sack, a failed writer on the verge of suicide, an ugly little monkey to book, but Lucifer enjoys visiting his girlfriends. There’s nothing devilish about these escapades. A visit to the office of Declan’s agent, where he manhandles a rival, could be any young writer’s fantasy; sessions with movie people are routine spoofs of Hollywood. Yet there are also those memories of career highlights (the original rebellion in heaven, the temptation in the Garden), as well as long, quite serious riffs on the Inquisition and the Third Reich, both splendid examples of the systematic evil Lucifer sees as a growth industry. Missing, though, is any internal dynamic to reconcile the snide and the solemn. Duncan has comic energy to spare but no clear idea of what to do with it. The result reads like a promising first draft.